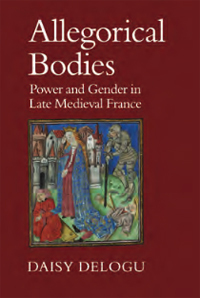 In her ambitious and beautifully crafted book, Allegorical Bodies: Power and Gender in Late Medieval France, Daisy Delogu explains how and why French authors associated with the royal court and the University of Paris elaborated upon female personifications of the church, university, and nation in response to the political crises created by the Hundred Years War, the mental instability of the French King Charles VI, and signing of the Treaty of Troyes in 1422. Such events, Delogu argues, demanded that the propagandists of the Valois monarchy construct their political identity and subsequent loyalties independently from the figure of the ruling king. Delogu's careful exploration of the formal, intertextual, and political interactions of these personifications makes two inter-related crucial contributions to the study of gender, political allegory, and the late medieval concept of nation. First, she demonstrates rather conclusively the political significance of the gender of the allegorical personifications that were constructed by authors who were associated with the Valois monarchy. 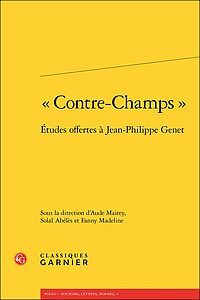 Second, she explains how female personification allowed poets to conceptualize the French "kingdom as a bounded territorial, cultural, and political space, one endowed with a coherence and unity that, from a geopolitical standpoint, fourteenth-century France did not possess" (48). Once conceptualized and portrayed as female, "beautiful, noble, and worthy, and also mistreated, weak, and needy", this personified kingdom could claim the loyalty that French subjects owed to the person of the king (177). Delogu's examination of the corpus of the late fourteenth-century poet and royal administrator Eustache Deschamps further demonstrates that the gender of an allegorical personification reflects its function. Deschamps employed both male and female figures to personify France, indicating "that the staging of female allegories is not a phenomenon to be chalked up to grammar, but a choice whose implications must be interrogated" (66). Only such purposeful choices explain the overly determined gender of late medieval allegorical representations of France, which personify "highly conventional female roles - courtly beloved, damsel in distress, noble widow, tearful mother" (177). Delogu's explanation of why authors favored female allegorical representations of France builds upon Renate Blumenfeld-Kosinski's examination of the affective role played by personifications of Ecclesia in poetic and theatrical works written during times of church schism. As Delogu observes, Deschamps employed "the conventions of courtly love poetry" (67) in his political allegories to cast both the church and France in "a range of feminine roles in order to solicit the sympathy, and hopefully the effective intervention of his public" (83). Moreover, Delogu asserts, Deschamps works influenced other poets and intellectuals who were associated with the French royal court by providing these authors with models for discussing the "nature of the political community, the relationships that governed its various components, and the place of the king within this system" (67). She then traces the evolution of personifications of France as a noble woman, and in particular as a noble mother who suffers physical harm as a result of her children's bellicose wars. Her detailed study of these personifications includes the works of Christine de Pizan, Jean Gerson, Alain Chartier, and Jean Juvénal des Ursins. Throughout her chapters, Delogu illustrates how allegorical personifications of France simultaneously solicit sympathy from male citizens and exclude women from power. By contrasting these elaborate female personifications of the realm with metaphorical representations of the French kingdom as a human body, she emphasizes how differently these two literary forms involve the reader. Metaphorical representations of the kingdom, which naturalize normative relationships among individuals of different status, invite readers to imagine where they fit in the body politic. Allegorical personifications, however, claim a subject position which seems independent from the reader and which allows the personifications to address the reader directly and demand an appropriate emotive response. Once created, allegorical personifications of kingdoms and institutions may authoritatively argue for particular political policies such as the illegitimacy of the Treaty of Troyes or the subordination of the Duchy of Burgundy to the crown of France. Indeed the multivalent political potential of such allegorical personifications encouraged authors to perform what Delogu terms "autoexegesis", namely the simultaneous description and glossing of their allegorical constructions (15). Delogu's careful reading and attention to surplus meaning allows her to expand our frames of reference regarding the purpose and effect of late medieval allegorical arguments. For instance, although other scholars have noted that late medieval French authors relied upon feminized allegorical personifications as a means of presenting unwelcome political advice to bellicose princes, Delogu makes visible the incredibly rich imaginative resource such personifications provided authors who were interested in fostering feelings of nationalism. Moreover, she clearly demonstrates the political power of both gendered discourse and the allegorical form by revealing the potent intersections between spiritual discernment, political allegory, contemplation, literary dream visions, and legal theory. In doing so she raises more questions than she can possibly answer and invites further exploration of the provocative connections she draws between female visionaries, especially Joan of Arc, and visionary female personifications, as well as between women's lives and the use of female personifications to promote political agendas. Renate Blumenfeld-Kosinski: Poets, Saints, and Visionaries of the Great Schism, 1378-1417, University Park, PA 2010; Virginie Minet-Mahy: Esthétique et pouvoir de l'œuvre allégorique à l'époque de Charles VI, Paris 2005. Renate Blumenfeld-Kosinski: Dramatic Troubles of Ecclesia: Gendered Performances of the Divided Church, in: Cultural Performances in Medieval France: Essays in Honor of Nancy Freeman Regalado, ed. by Eglal Doss-Quinby / Roberta L. Krueger / E. Jane Burns, Woodbridge 2007, 181-193. Misty Schieberle: Feminized Counsel and the Literature of Advice in England, 1380-1500, Turnhout 2014; Nancy McLoughlin: Jean Gerson and Gender: Rhetoric and Politics in Fifteenth-Century France, Basingstoke 2015.